You may recall our earlier post about some of Piaget’s special releases this year to commemorate the 60th anniversary of the Altiplano collection. Today we bring you one of their special birthday pieces – the limited edition Altiplano Tourbillon High Jewellery, the first time the Altiplano collection has featured a tourbillon. The dark dial of this striking complication is not as simple as it may seem at first glance. It is what is called ‘flinqué enamel’. So what is this type of enamelling? It starts with an engraved guilloché pattern (in this instance, starburst) on a sheet of metal (for this piece, gold), which is then thinly coated with layers of transparent enamel, with each layer’s oven firing at about 820 degrees. After this process has been completed, the resulting dial is polished, which is what gives it this dramatic gloss. It looks almost black in these photos, but this is due to the lighting when we saw it; it is in fact a very dark blue-grey. Visible through the white gold 41mm case is the ultra-thin manual-wind Calibre 670P tourbillon movement, which measures a scant 4.6 mm thick. 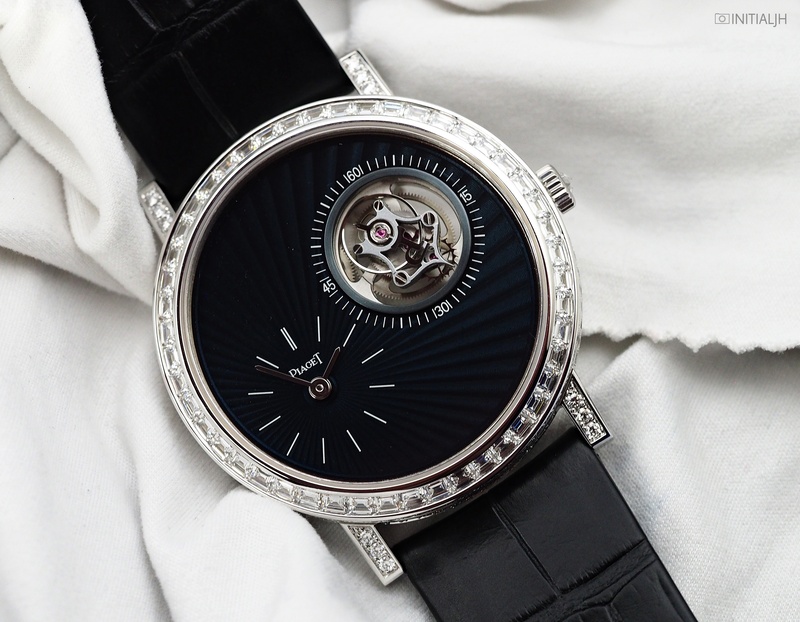 It is equipped with a patented stem-winding system featuring an intermediate wheel, and a new barrel. The movement beats at 21,600VPH and has 48 hours of power reserve. It has circular Côtes de Genève and hand-applied circular graining on the mainplate and bridges, and the tourbillon’s bridges and carriage are hand bevelled. The flying tourbillon features a titanium carriage weighing 0.2g. Last but not lease, we cannot forget about the ‘high jewellery’ bit – the case, lugs and buckle have baguette and brilliant-cut diamonds, with a total of 5.07 carats. Coming in a limited edition of thirty-eight pieces, the RRP is 212.000 EUR.